The Federal Laboratory Consortium for Technology Transfer (FLC) has recognized National Institute of Allergy and Infectious Diseases (NIAID) with an Excellence in Technology Transfer Award for their work on unique and expedited agreements needed for Ebola vaccine development after the 2014 Ebola outbreak. NIAID Vaccine Research Center (VRC) scientists had already been developing and testing Ebolavirus vaccine candidates for over 15 years when the largest outbreak in history started to unfold. 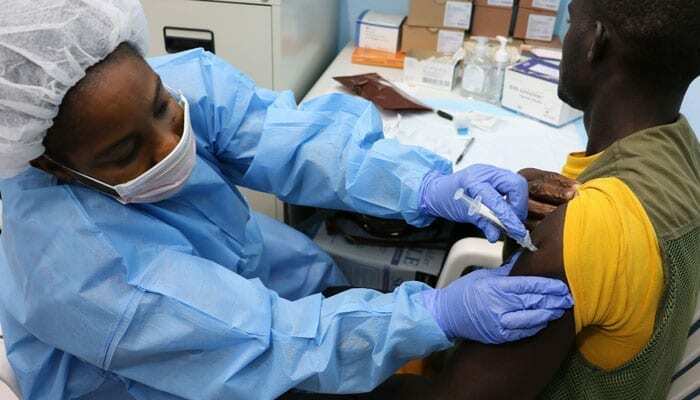 As the Ebola outbreak escalated, the VRC collaborated with pharmaceutical company GlaxoSmithKline (GSK) on NIAID-planned clinical trials to test Ebola vaccine candidates. The road leading to this collaboration started in 2008, under a VRC research collaboration agreement with Okairos, a Switzerland-based biotechnology company specializing in vaccine platform technologies, which was later acquired by GSK. Vaccine platforms are how a vaccine gets delivered to the immune system. The VRC was given access to one of Okairos’ platforms, a chimpanzee adenovirus vector (cAd), to deliver the VRC’s candidate Ebolavirus (EBOV) glycoprotein gene, creating the cAd3-EBOV vaccine. The approach resulted in an effective immune response to EBOV glycoproteins in humans. NIAID researchers then worked with Leidos Biomedical Research, Inc. scientists to manufacture the EBOV vaccine candidate in preparation for clinical trials aimed at testing safety in humans. In 2013, GSK acquired Okairos, along with their collaboration with NIAID. In response to the outbreak in 2014, time-sensitive agreements were established to expand the scope of the partnership to respond to the Ebola crisis. Agreements were negotiated and executed at an accelerated pace to allow clinical studies to begin as soon as regulatory approval was granted. Unique agreements were drafted to circumvent anticipated delays that could have slowed the start of clinical trials. Adjustments were made to a restrictive material transfer agreement that was used to send cAd3-EBOV test particles to the clinical trials sites in the United Kingdom, enabling it to clear customs and make it to the clinical pharmacy within the planned timeframe for initiation of the clinical protocol. This quick work allowed the clinical trial to begin within hours of the execution of the clinical trial agreement, ensuring that valuable time was not lost. GSK continued the development of the cAd3-EBOV vaccine candidates in Phase II trials in Africa. Previous article April Showers Bring…Pandemics?